Give your pet the convenient luxury to come and go as they please with the BarksBar Premium Dog Door. 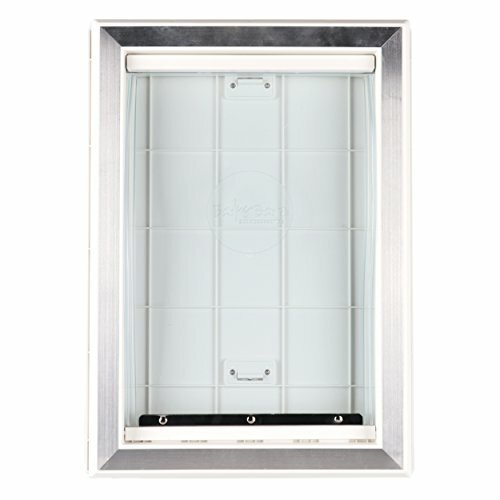 Redesigned with a sleeker aluminum edging and fitted on a sturdier thermoplastic impact-resistant frame, the BarksBar Premium Dog Door is perfect for daily use while complimenting any home's décor. The soft and flexible see-through vinyl flap features a strong magnetic closure while providing a comfortable weather-resistant seal against rain, wind and insects. Simply slide the self-locking panel down to restrict access to unwanted guests and provide security for your home when the door is not in use. Designed with the pet's safety and owner in mind, the BarksBar Premium Dog Door features the quickest and easiest installation on the market and is truly where convenience and luxury meet! If you have any questions about this product by BarksBar, contact us by completing and submitting the form below. If you are looking for a specif part number, please include it with your message.